The Pineapple (Ananas comosus) belongs to the Bromeliaceae family native to South America. It is a herbaceous perennial tropical plant with a short and thick stem. Inflorescence contains between one hundred and two hundred flowers placed in a spiral form. Flowering lasts between thirty and sixty days approximately; The ripe fruit is obtained one hundred and thirty-five days after the flower has emerged. Climate: Pineapple needs an average temperature of 25-32 ºC, a regular precipitation regime (between 1000-1500 mm) and a high environmental humidity. Although pineapple tolerates relatively long periods of drought, lack of water when planting and at the beginning of flowering and fruit set, slows growth and reduces fruit size. Light: High luminosity favors the performance, the good coloration of the shell and the good quality of the fruit. Soil: Light and well-drained soils rich in organic matter. One of the soil factors limiting pineapple growth is the low permeability mainly in rainy climates, as it promotes the attack of pathogens in the root system. pH: Between 4.5 and 6.5 being ideal for the growth of the plants from 5.0 to 6.0 . pH higher than 6.5 increases the risk of microelements deficiencies. 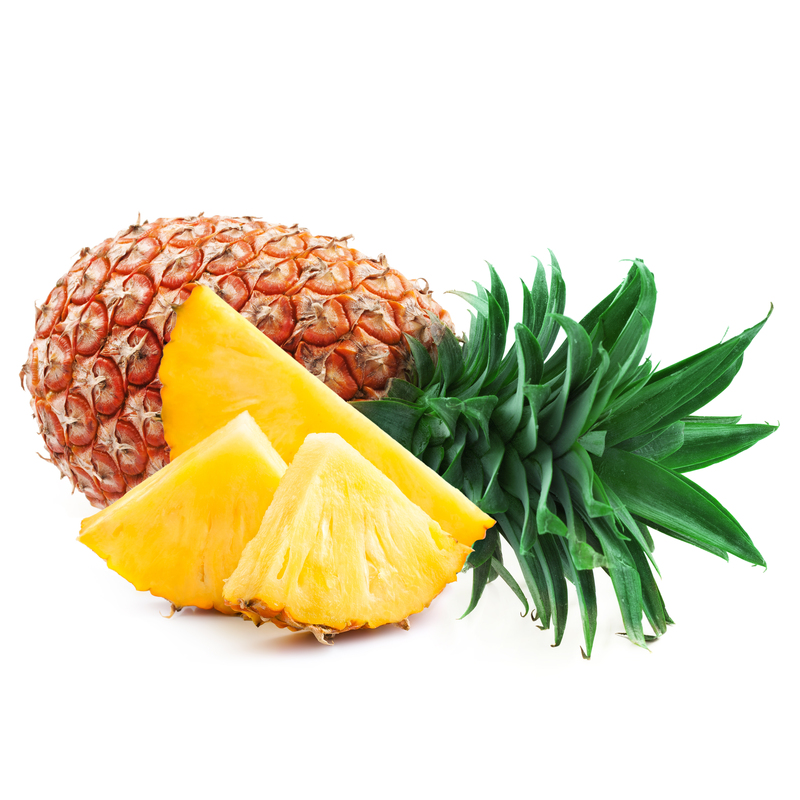 Nitrogen and potassium are the most important nutrients for pineapple. Nitrogen is a yield influencing factor and potassium over fruit quality, mainly. At first stages of development phosphorus application is recommended in order to contribute to a good root development. Fertigation can be successful when used with high frequency localized irrigation. Nitrogen is most often applied with irrigation, followed by K, Ca, Mg, and S. Micronutrients may also be applied by fertigation. The architecture of the plant and the morphological and anatomical characteristics of its leaves favors foliar absorption of nutrients. 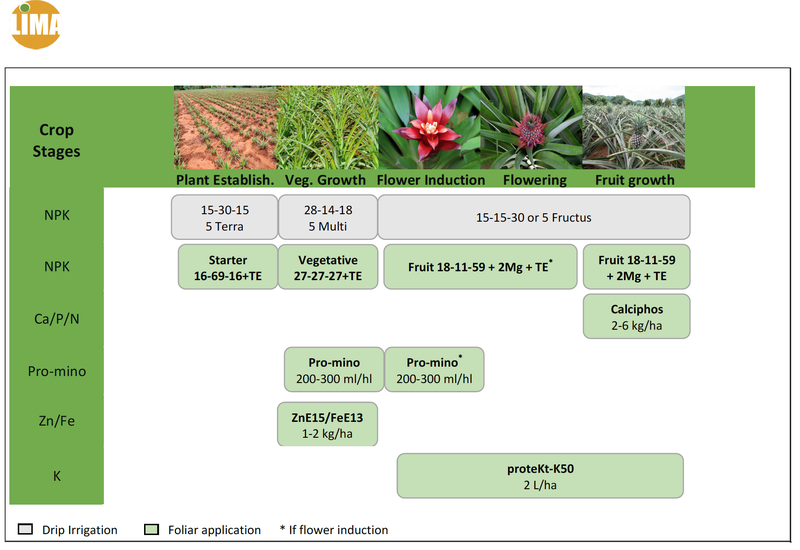 This method of application, which is widely adopted by some producers, is frequently used to apply N, K, Mg and Zn (very important for pineapple) and Fe. Supply of Ca during the development of the fruit is transcendental, since it improves the quality of the fruit and gives greater tolerance to bacterial diseases. Foliar fertilizers can be applied every 15 days or every month depending on varieties and local conditions. Fruit 18-11-59 + 2 MgO + TE: 2-5 kg/ha. Apply 2-4 times two months before flowering. In order to induce flowering, apply one month before stem thickening. During fruit growth start applications at the beginning of fruit filling.